On my last visit to Rome, however, I tried another typical Roman pasta for the first time: Rigatoni alla Gricia. A dish that some — quite sensibly, in fact — refer to as the foundation for both Carbonara and Amatriciana. Others call it Amatriciana in Bianca. Me, I see it more as a cross between Carbonara and Cacio e Pepe. Either way, it simple and comforting yet rich, intense flavor fits the mold quite well. Gricia is, essentially, Cacio e Pepe with guanciale. Carbonara without egg. Or Amatriciana without tomato. (I’ve fallen into the same trap!) In actuality, the latter is probably the most accurate, since many believe it was the precursor to the red sauce, before tomatoes were abundant available in the region. The name is also thought to come from Grisciano, a town just north of Amatrice. Gricia involves only a few ingredients. 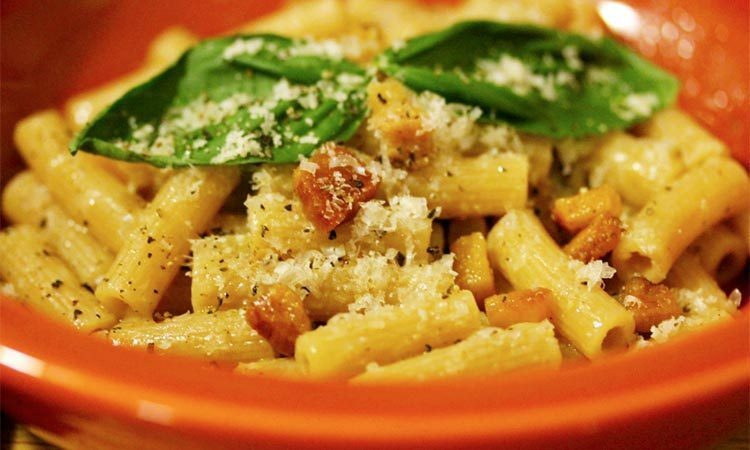 Pork (preferably guanciale, though pancetta is a reasonable substitute), Pecorino cheese, black pepper and pasta. That’s all. So simple, yet so luscious. As the Romans do best. Add black pepper to pan. Add a ladel of pasta water to the pork. Add pasta and cheese and mix. Use more pasta water if it sticks. Serve with more cheese on top. As with our findings related to pairing wine with Carbonara, looks can be deceiving here. Just because it’s light in color doesn’t mean it’ll match to white wine. The fatty pork and the aged cheese suggest — nay, demand — a hearty red. Any quality Central Italian should do the trick; in our case, an IGT rosso from Montefalco matched quite well. Haven’t had that Roman dish, but to be honest I’m not a fan of guanciale or pancetta.